Dimensions 1 by 8 by 10 in. 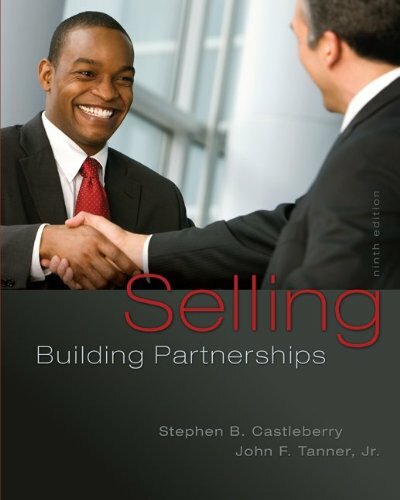 Amazon.com description: Product Description: Selling: Building Partnerships 9e remains the most innovative textbook in Selling with its unique role plays, mini-cases, and focus on knowledge and skills critical to the partnership process and successful business professionals. Emphasized throughout is the need for salespeople to be flexible and adapt strategies to customer needs, buyer social styles, and other relationship needs and strategies. This is followed by thorough discussion of the salesperson as manager and how planning and continual learning enable effective selling and career growth. This market-leading textbook has been recently updated to include McGraw-Hill's Connect and SmartBook (available Summer 2016). About: Selling: Building Partnerships 9e remains the most innovative textbook in Selling with its unique role plays, mini-cases, and focus on knowledge and skills critical to the partnership process and successful business professionals. About: Selling: Building Partnerships, 8e remains the most innovative textbook in the Selling course area today with its unique role plays and partnering skills which are critical skills for all business people.